Zombies, Zombies, Zombies. The market is full of Zombies. There's World War Z, the Walking Dead, and Fubar. I have even entered the field with last year's thankfully popular Great Zombies in History comics from Elevator Pitch Press. (Look for the trade in August) There really aren't many zombie frontiers left. Needless to say, it is really difficult to find a new spin on the zombie story. But, not only has Rob Anderson done it, but, with Rex, Zombie Killer, Rob has done it in a way that makes you wonder why no one has thought of this before. Everyone knows a zombie apocalypse story isn't really about zombies. Zombie stories are about the survivors. "The Walking Dead" are not the zombies. Until now, every one of these stories have focused on the human survivors. Rob takes that concept a step further. What happens to the animals left behind after the zombie apocalypse? "In the wake of a zombie apocalypse, a hyper-intelligent Golden Retriever named Rex, a sign language-speaking gorilla, and a small pack of animals begin a perilous cross-country journey to find safety...and a home." _Now, I admit that I know Rob. I like to think that we are good friends and he is a really great guy. And Dafu, the artist, and I are currently working on no less than four projects right now (I should also add that I have so many projects with E.T. Dollman, the letterer, that i think I talk to him more than my wife). But, despite all that , the book is good. If it wasn't, I wouldn't say it, I just wouldn't have said anything at all (Right now, I'll bet several of my creator friends are wondering if that's why I never mentioned their book.) More importantly, all of these other people wouldn't say how good the book is. Rob Anderson is a talented guy and you should get in on the ground floor with him. Dafu Yu is one of the most talented artists that I know (and hopefully I can prove it with a project we just finished). I wish them great success with the book and I sure hope they both remember me when they are famous. I have had the pleasure of seeing this story develop on the Comics Experience Workshop. And Rob was nice enough to let us include the zero issue in the Great Zombies in History trade, which we both worked on for Elevator Pitch Press. My only complaint is that it is only a single issue. I think Rex's adventures would make a great ongoing series. Hopefully the sales of this one and done will prove that. (Otherwise, I'm going to have to make Rob act out the rest of the story at our regular lunches). So, how do you get it? The book is listed in the February Issue of Previews (order Code FEB12 0806), which means it comes out in April. But, don't wait for it being to be in stores then, go to your local shop and tell them you want it. That way they will order it. (You would be amazed at how many times someone comes up at a show and tells me that they couldn't get an issue of X because they just assumed the shop would carry enough copies and didn't preorder it.) In fact, you should click on the below image, print it out and hand it to your comic shop if it is something you think you might like. 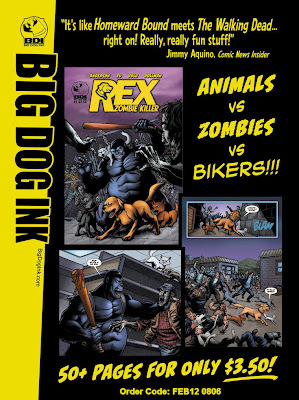 And if you love Rex, remember that the special Rex zero issue (along with other great stories featuring Rob, Dafu, E.T. Dollman, and (ahem) me, are available in the Great Zombies in History trade coming soon. Happy President's day. As I sat down to write this I was just going to combine earlier posts from previous President's Days since I have written about both Abraham Lincoln in Science Fiction and George Washington in Comics. But, before as double checked (actually centennially checked would be a better word) the Great Zombies in History Trade file we sent to the printer, I realized that the series and the book had no less than 3 US President's in it. So, in the vein that you should always be closing, I thought I would mention them. In "Dead and Endless Wastes" Frederick Kim tells an amazing story about a young Teddy Roosevelt. The future President discovers something while he is ranching the Bad Lands of the Dakota Territory in 1884 that will change his life. Dead and Endless Wastes (Writer & Letterer, Frederick Kim with Artist, Antonio Bifulco) was originally featured in issue 2 of the series and will be available in the trade paperback along with behind the scenes sketches. My story, "the Zombie War of 1812", involves the real reason for the fire that nearly destroyed Washington, DC on August 14, 1814. As such, you can imagine that several past and future President's play a role. Since it involves zombies, I was not limited to those that were living at the time. The Zombie War of 1812 (Writer, Joe Sergi with Artist, Marc Jacobs and Letterer, E.T. Dollman) was originally featured in issue 2 of the series and will be available in the trade paperback. Now I've got to go and check that file one more time. I recently recorded an episode with the awesome guys at Comic Geek Speak. We talked about the recent Ghost Rider decision and the suit filed regarding the Walking Dead. I love doing these episode (and these guys). I always have to be careful to walk the line and be an historian as opposed to lawyer, since I don't do this kind of law and would hate for people to think anything I said was anything more than pure conjecture and informed reading comprehension. Still, I love doing shows on these kinds of topics and have actually been toying with idea of a book on the subject. If anyone thought that would be interesting. he show can be found here or you can just listen to it below. I'd love to hear your thoughts? By the way, I mentioned a few of books on the episode. Here is the cover to the Great Zombies in History Trade we are finalizing and the amazing Rex, Zombie Killer book by Rob Anderson that I talked about. I have also includeda super secret pre-production cover for Aliens Among Us, our newest anthology.